Maris Sal is carried by selected retailers in Scandinavia who share our passion for premium accessories made from highest quality materials. If you'd like to start carrying Maris Sal’s collection, please register below or, if you are already a registered re-seller, log-in to order directly online. Our most popular model with our signature Maris Sal anchor. Made of highest quality, waterproof stainless steel, no need to take it off for sailing, swimming or showering. Available in our signature cord in navy blue color and 5 sizes: 6.5-8.5”/16.5-21.6cm. Another favourite model by our female customers, easily adjustable in a size that’s fits most ladies. Made of highest quality, waterproof stainless steel, no need to take it off for sailing, swimming or showering. Adjust the size once and then use the anchor to easily fasten and undo the bracelet. Available in an adjustable size that fits wrists up to 7.1”/18 cm. A classic, nautical necklace hanging beautifully from an adjustable rolo chain. 2.3 mm rolo chain. Height of anchor: 1.18” (3 cm). Adjustable length between 21-23.5" (55-60 cm). Our boldest model with our signature Maris Sal anchor, made for genuine sailors. Available in our multi-coloured signature cord in navy/red/white and 3 sizes: 6.5-8.5”/16.5-21.6cm. Made of the same highest quality, waterproof stainless steel, but with a with a gold-plated anchor. 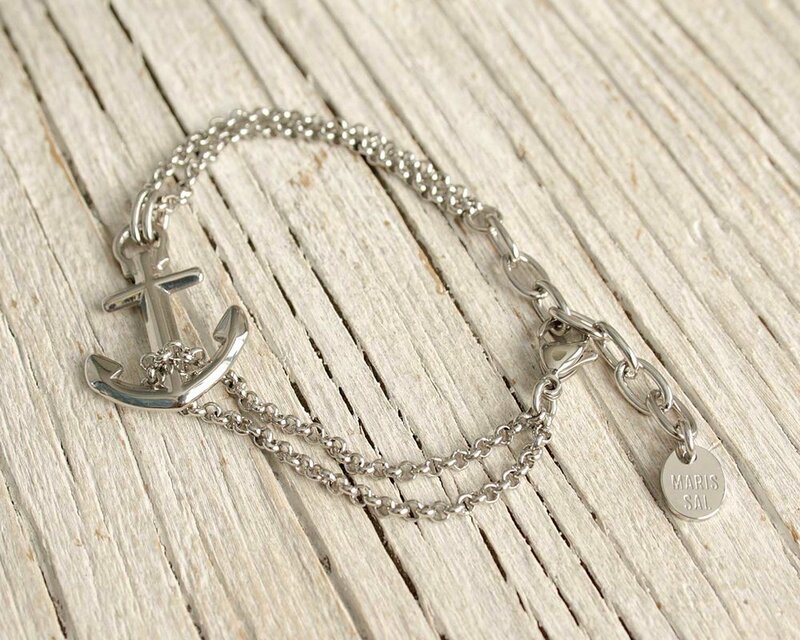 Adjust the size once and then use the anchor to easily fasten and undo the bracelet. Made of the same highest quality, waterproof stainless steel, but with a with a gold-plated anchor. A favourite model by our women customers, easily adjustable in a size that’s fits most ladies. Available in our multi-coloured signature cord in navy/red/white in one-size 6.5-7.3”/16.5-18.5 cm. A favourite model by our male customers looking for a casual, nautical style, accessory. Made of highest quality, waterproof stainless steel, no need to take it off for sailing, swimming or showering. Attaches with a magnetic closure. Available in our multi-coloured signature cord in navy/red/white and 5 sizes: 6.5-8.5”/16.5-21.6cm. 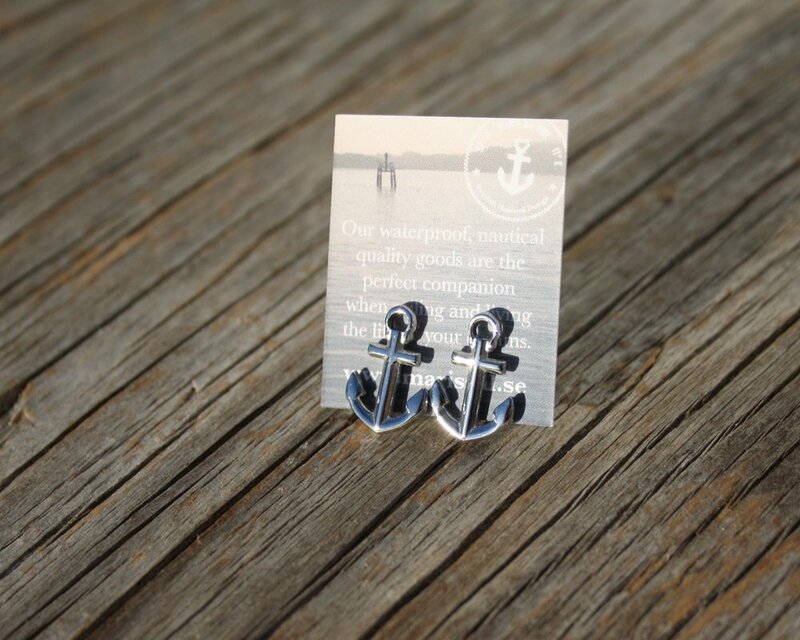 Our popular anchor earrings that give every outfit a classic, nautical style made with our signature anchor in a petite size.